The house was bare. I was wiping down the shelves where our books used to live. Two Sundays ago was our last night in our first house. Suddenly, Greg burst through the back door and drug me outside in a hurry. Tiny flurries were floating to the ground. It wouldn't last long, but for the first time this winter, it was snowing. We stood there holding each other, faces to sky, stealing a moment from the cleaning to embrace the nostalgia. This is the house we came home to after our honeymoon. 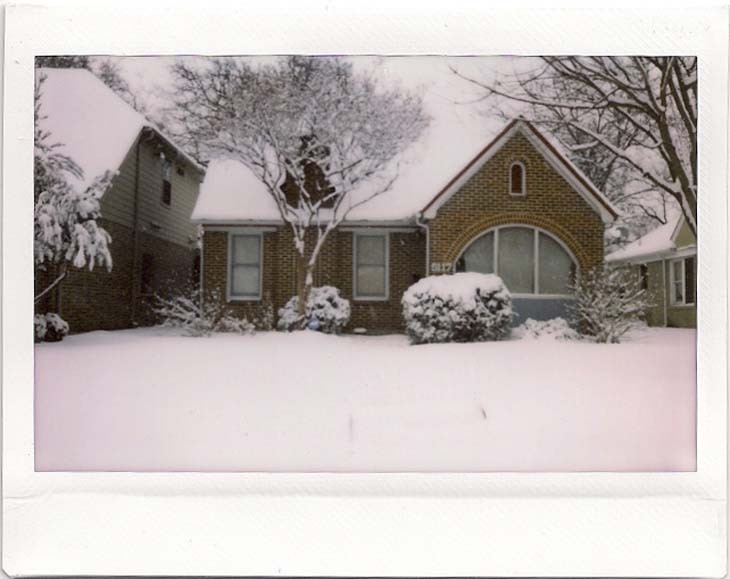 We built snowmen in the front yard of this house last winter and napped in hammocks in the backyard last summer. Many a night, we danced in it's kitchen while making dinner, fell asleep cuddling on the couch, and had crazy parties. After just one year, this house held so many memories. And this final memory, standing in the snow, felt like a little gift. It was kind of magical. Goodbye first house. We'll miss you. *This photo is from last winter, soon after we moved in.